"How do I separate my worms from the compost?" One of my customers ask me this question recently. It's been asked frequently throughout the years. There a several ways to separate your worms from the old bedding (vermicomost or worm compost) and I'd like to discuss some of them today. The amount of worm compost and worms you have will determine the method you use. 1. Hide and Seek: If you just have a worm bin or two that you use for vermicomposting, you can use this method of separating out your worms from old bedding. It also works suprisingly well for large amounts of worms and bedding. Set up a table near your worm bed, out of the sun but in daylight. Scoop out your bedding/worms into several small pile beside each other on the table top or board. The worms will instantly crawl towards the bottom and center of each pile to escape the light. Going from pile to pile, dust off the empty bedding into a container as the worms dissapear. As you move along, the worms in each pile will have time to move further into the bedding. Eventually, the worms will form into a squirmy ball. Don't try to remove every last bit of old bedding, since exposure to light and drying air damages the worms. You're just trying to remove the majority of it without hurting your worms. 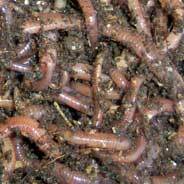 Once you have removed the bulk of the old bedding or vermicompost and castings, place your worms into fresh, moistened bedding (which you should have prepared in advance). Cover your worms to protect them from drying out and UV damage. 2. Shaken Not Stirred: For this method of separating out worm compost, you need to build screens with which to "shake out" the worms. Build two screens, one with 1/4 inch hardware cloth, the other with 1/8 inch hardware cloth. The smaller grade of screen allows you to separate out the smaller worms and eggs. Build the larger grade screen to fit the top of your worm bed. Add a lip to the bottom to hold it in place as you slide the screen back and forth across the worm bed. Prepare a container with some moistened peat moss to hold the harvested worms. Remove any uneaten food from the top of the bedding and place your screen at one end of you bed. Scoop out some worm/compost, place in the screen and slide it back and forth. The compost will fall through leaving the worms in the screen. If you want to harvest all the worms and eggs, shake the compost into a separate container. Harvest the larger worms with the larger grade screen, then run the compost back through the smaller grade screen to get the smallest worms and eggs. Remember to place your harvested worms into fresh bedding A.S.A.P., since worms are very sensitive to light and will dry out very quickly. Work only small amounts at a time and get those worms recovered pronto. We'll discuss other harvesting methods in upcoming posts. Find complete details about this post and comprehensive worm farming business instructions in my "Worm Farm Manuel - A Step-By-Step Guide To Raising Earthworms As A Home Based Business".